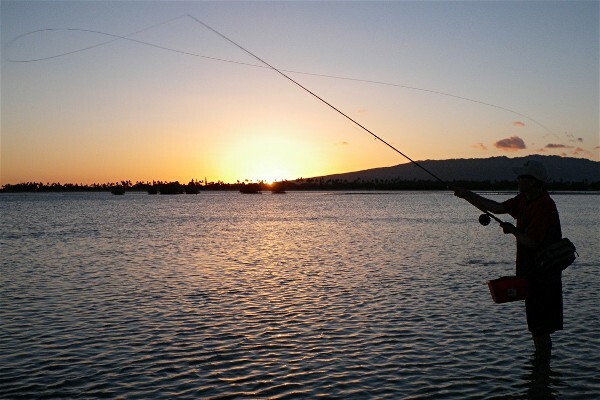 Hawaii has both fresh and saltwater fly fishing opportunities. Oahu does not have large populations of fish, but a guided fishing tour here can offer a chance at catching some nice sized fish and provide an exciting diversion from the standard Hawaiian tourist activities. Hawaii�s inshore saltwater species include bonefish, trevally, barracuda, ladyfish, and various other colorful reef fish. Offshore fly fishing for pelagic species is also available (email for info) but is mostly done out of Kailua-Kona on the Big Island of Hawaii. Saltwater fly fishing here is generally pretty tough as you can expect 10 to 20 mph tradewinds over 80% of the time. Also, the fish populations have been impacted by a general lack of fishing regulations and generations of locals killing and eating everything they catch. If you intend to fish the inshore salt, an 7 to 9 weight rod and a saltwater safe reel with at least 150 yards of backing is essential. A full floating line will work in almost every shallow water situation, but it is also good to have an intermediate or sinking line handy, depending on where you fish. 9-12 foot tapered leaders and tippets in 12-20 lbs. test are sufficient. Proven bonefish flies include xmas island specials, small clousers, reef specials, charlies, and sand shrimps. Most other standard bonefish patterns will also work. Small (size 4-1/0) streamers in baitfish colors are effective on trevally, barracuda, and other predatory fish. Other gear you will need includes: flats boots, polarized sunglasses, sunscreen, and tropical weather appropriate clothing. Nervous Water Fly Fishers is a full service fly shop that can equip you with everything you�ll need for your Hawaiian fishing adventure. 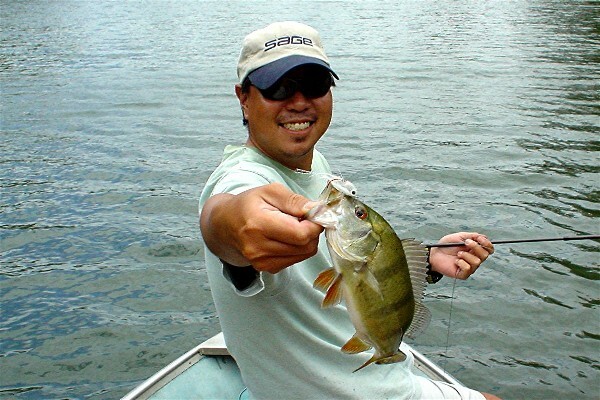 Freshwater gamefish on Oahu include Peacock Bass, Largemouth, and Smallmouth Bass. There are also bluegill, catfish, and various species of cichlid available. Rainbow trout are only found on the island of Kauai. Freshwater fish populations are generally healthier than in the salt, since Lake Wilson reservoir on Oahu is catch and release only for the bass and peacocks. You will need a license to fish the freshwater, but for whatever bizarre reason you do not need a license to fish saltwater. Freshwater tackle consists of standard trout or bass gear from 4 to 7 weight. Reels do not need much backing. Small streamers and poppers work well for the bass and peacocks. Lake Wilson has limited bank access and is best fished from a boat. Shoreline fishing will entail a lot of roll casting since much of the bank is lined with trees and tall grass. There are guides available for fishing Lake Wilson. If you would like to hire a guide for freshwater fishing, or want more info on fishing the lake please see www.hawaiibassfishing.com Peacock bass and largemouth are also abundant in several reservoirs on Kauai. Please note that we do not guide on any of the neighbor islands of Hawaii. Fly fishing is still very new here, and there are very limited (if any) fly fishing guide operations on the neighbor islands and no fly shops. Feel free to email us if you have any specific questions. Mahalo!